When technology and service companies talk about energy efficiency, they’re usually talking about large commercial and industrial structures, or high-end luxury homes. Those are the buildings where you’ll find the sensor networks, building management systems, and cool gadgets that have come to define efficiency technology. While the payoffs from using such systems are significant, the vast majority of commercial and residential buildings can’t afford to use them. The opportunity to reduce utility consumption is hardly relegated to high-end structures. 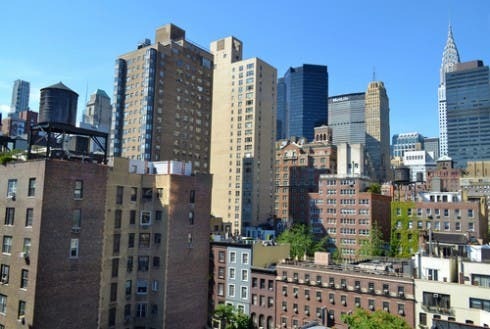 An inefficient apartment building in the Northeast, for example, consumes four times the energy of an efficient one on average. Considering that utilities are the single largest operating expense for these buildings, this is an enormous gap that directly impacts the bottom line for building owners. The case for investing in efficiency measures for the worst-performing buildings is often obvious, and returns on investment can be realized in staggeringly short time frames. Why then, if the math is so clear, do these buildings remain inefficient? The problem is that knowing something in the abstract is very different from having actionable information to make decisions. Once a building owner understands that their building is a particularly poor performer, they will make the economically sensible decision and invest in appropriate efficiency measures. But how do they know if their building is inefficient? This information gap represents significant opportunity, and a market where this is perhaps most obvious is multifamily buildings. These buildings occupy a sweet spot between large-scale/ high-end structures and single-family homes. While their utility bills are high enough to justify efficiency investments, they often don’t have the capital resources to afford high-end management systems. In many parts of the country, multifamily buildings are older than their single-family counterparts, so there is greater room for improvement. Finally, the properties are operated as businesses, so owners are actively seeking ways to reduce operating expenses. The multifamily sector has mostly been ignored by the traditional players in the efficiency industry, largely because their business models didn’t address that domain. Multifamily property managers who seek to improve their buildings’ performance generally manage dispersed sets of paper bills and manual spreadsheets that make it nearly impossible to reach any useful conclusions. The underserved multifamily market is significant, and growing. Increased urbanization has already driven a spike in multifamily housing — there are currently 28.1 million multifamily housing units in the United States — and Pike Research predicts that multifamily buildings will expand to more than 25% of residential housing by 2021. If we can make multifamily buildings more efficient, we will significantly improve the environmental impact of residential buildings overall. A number of innovative software solutions have begun to fill the information gap in the building efficiency market. Web-based tools that rely on data from utility companies and self-reported building characteristics can be used to track energy and water use, and perform peer-to-peer benchmarking. By using cloud-computing infrastructure, the costs to use these systems are incredibly low. Traditional sensor-based systems supply immense amounts of dense data for one building at a time, and pose challenges for non-experts who want to sift through all of this data. The newer web-based utility analytics platforms, on the other hand, deal with relatively simple data across large numbers of buildings. They are designed from the bottom up to provide valuable, actionable insights while avoiding problems of information overload. Software alone can’t make buildings more efficient, but it can solve the main bottlenecks that prevent people from taking action. Tracking and Understanding Data: Measuring performance is a vital first step towards making improvements. This is true whether you’re talking about tracking vitamins and calories to keep healthy, using software like Mint.com to track finances, or using a cloud-based web app to track buildings’ utility consumption. The key, from the software perspective, is to make tracking as easy and automated as possible, while making data understandable — nobody wants to deal with piles of spreadsheets. The most successful products make us want to use them through engaging design (just look at Apple). In the efficiency domain, more companies are starting to realize this, and products like WegoWise are focused on this usability and design element. Benchmarking Buildings: A key advantage to using web software is the ability to make comparisons within large portfolios and across large community-driven datasets. A property manager can quickly identify the outliers in their portfolio to target for investment. A specific building can be compared with an average building with the same structure, size, location, etc. Or, a building can be compared to the most efficient buildings with the same characteristics, thus providing a data-driven sense of opportunity for returns on investment through retrofits. By comparing on a normalized basis across these benchmarks, property managers can implement upgrades where they’ll have the biggest impact. Multiple studies demonstrate the powerful impact of benchmarking. Companies like Opower have focused on the psychological component to this, and have shown that comparing yourself with your neighbors can drive significant energy savings. A recent study released by Deutsche Bank indicates that benchmarking is critical to drive retrofits with a high ROI for multifamily housing. Furthermore, 21 states have or are considering a building energy disclosure ordinance – making tracking and benchmarking not just good business, but required by law. Targeting outliers: The most economically compelling approach to improving building efficiency is to focus on those structures that have the most significant opportunity for improvement. For example, New England real estate development and management firm John M. Corcoran & Co. has used this approach to identify half a million dollars in savings while tracking 12,000 units. By using WegoWise’s web-based benchmarking software, they found a major outlier: one of their Boston buildings was using one million more gallons of water per year than it should have been. Company engineers ran inspections, and found and replaced leaky toilets, resulting in $80K annual savings from a problem they never knew they had. Affordable web-based platforms facilitate the democratization of building efficiency by more effectively tracking critical data that already exists, providing meaningful benchmarks and comparisons, and converting data into actionable information — all for the monthly cost of a trip to Starbucks. Every building — no matter the size or type — should have the chance to seize efficiency gains. Author Bio: Barun Singh is the Founder and Chief Technology Officer (CTO) of WegoWise. Barun created WegoWise out of a vision to dramatically reduce energy costs through a simple and powerful online tool. He leads all aspects of product development and technological innovation for WegoWise. Prior to WegoWise, Barun was owner and CEO of Thinkify LLC, an Internet technology development and consulting company. He completed undergraduate studies at the age of 16 and holds three graduate degrees, including two from the Massachusetts Institute of Technology (MIT), where he worked in the Computer Science and Artificial Intelligence Laboratory.